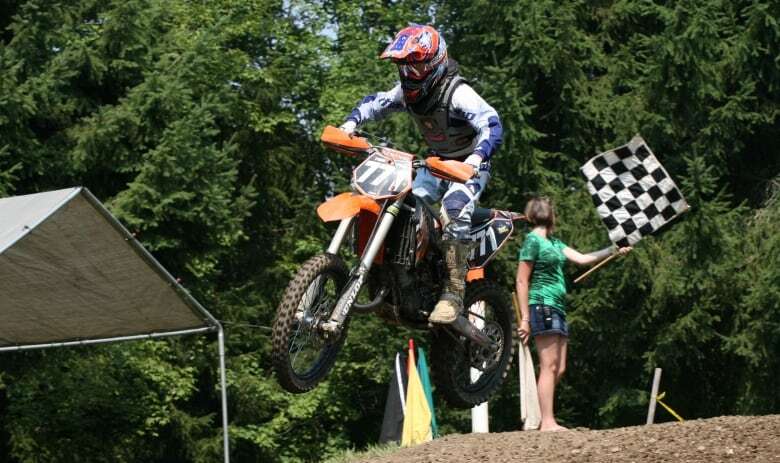 Three years after a devastating back injury, a motocross racer from Stoney Creek, Ont. is not only walking again, but also preparing to run for a good cause and return to the race track. Soon after his motocross accident, Pauly Plewa was given a brochure and asked to pick the colour of the wheelchair that he would soon get. 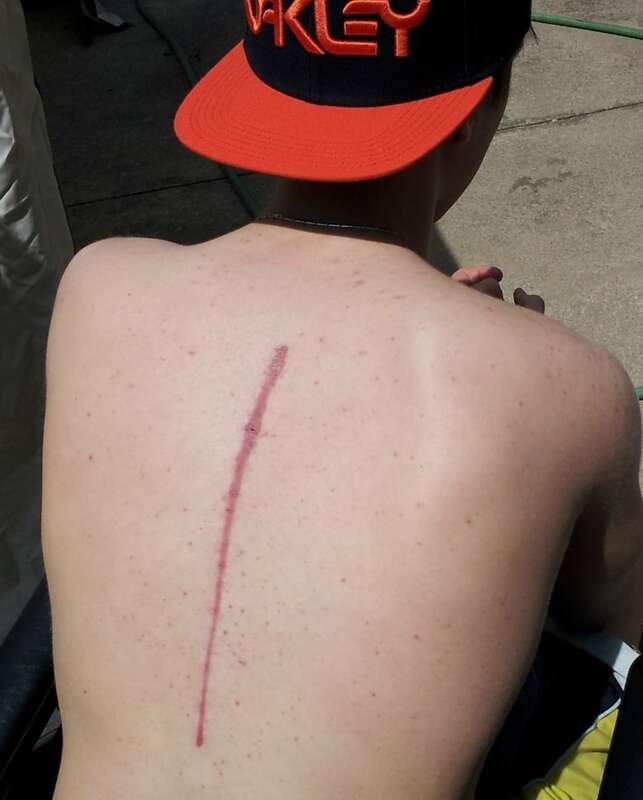 With a devastating back injury that required his vertebrae to be fused together with metal rods, he was told that his chance of regaining any sensation below his chest was less than two per cent. Three years later, not only is he able to walk on his own feet, he is also getting ready for a 10-kilometre run. The 19-year-old, originally from Stoney Creek, Ont. 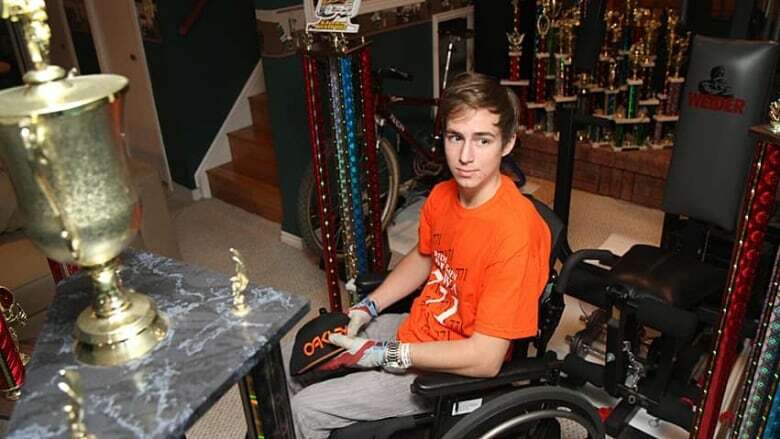 and now living in Canfield, will take part in the Wings for Life world run in Niagara Falls in May to raise awareness for spinal cord injuries. "This run is to educate the general public about what it is like to have a spinal cord injury, what the side effects are and how it really affects your life," he said. "I think it would make people a lot more grateful." The star racer's career took a detour on March 18, 2012, just weeks before his 17th birthday. After qualifying as one of the two Canadians to race in the Arenacross World Championship in Las Vegas, he went to New York to practise. After hitting a rough patch, he went head first over his handlebar and landed on the ground. His bike – 113 kilograms of metal with 80 km/h of momentum – landed on him, essentially snapping his back in half. He sustained injuries to his spinal cord and brain, and lost all functions below the chest. "I was completely paralyzed. I had no sensation, no function. I had nothing," he said, "I lost bladder and bowel function. I even lost the feeling of hunger and thirst." The emotional stress was equally traumatic, Plewa said. "You go from being in the best shape in your life, like I was, to being completely paralyzed," he said. "I lost all independence. I had to sit there wearing a diaper." Plewa was transferred from McMaster Children's Hospital to Hamilton General Hospital. He then began his recovery at its rehab centre. Due to the spinal cord injury, Plewa had to retrain his muscles and nerves to understand the signals from his brain. "I would sit there until three or four in the morning, meditating and just forcing that signal to go down my toe," he said. "It's a full-time job. It's every day, 24/7. You're always thinking about it, always your number one priority." Three years after the injury, he can now walk on his own feet with a slight limp. Also, he no longer needs a modified hand device to help him drive, and he has returned to driving normally — with manual transmission, no less, like he did before his injury. Plewa is now continuing to work on his motor skills and getting ready for the run with the company of his two-year-old husky, Yuki. Taking place on May 3 in Niagara Falls and 34 other locations around the world, the Wings for Life race attracts runners of all abilities and raises funds for spinal cord research. Runners get a 30-minute head start before a "catcher car," a moving finish line, starts to catch up to them. The average distance the runners complete is five kilometres. Plewa said he is aiming to double that. Pauly Plewa on the race track before his injury. (Submitted by Pauly Plewa)But his goal goes far beyond the finish line: He is preparing to get back on his bike. ​"It feels like there's a part of me missing, as if someone had come and amputated something from me," he said. Plewa began riding when he was only six years old, after his father Andy, who raced in his native Poland, bought him a bike. Plewa then proved himself to be a talented — and dedicated — racer, waking up at 4 a.m. every day to go to the gym before going to high school, spending three hours commuting to the nearest practice track, and eating and doing homework on his lap in the car. "Motocross was my life. Everything I did was to make myself better," he said. "To me it felt like I was making art. It was poetry in motion." Aiming for a summer-time debut, he has already come up with a name for the spectacle: the Return of Pauly Plewa.